Dermalogica Pure Light SPF 50 shields the skin from UV-induced hyperpigmentation, including brown spots, discoloration and uneven skin tone. 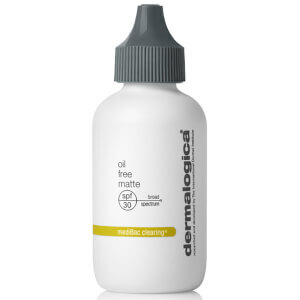 This medium-weight daytime treatment features Oleosome technology, which uses natural plant spheres filled with sunscreens to increase SPF performance. This moisturizer with SPF 50 contains a powerful peptide to help regulate melanin production while a potent blend of Red and Brown Algae combined with botanical extracts, helps balance uneven skin tone. Cross-linked Hyaluronic Acid fortifies the skin‰Ûªs natural moisture barrier, reducing the appearance of‰Û¬ fine dehydration lines. This premium tinted moisturizer with SPF is formulated without artificial fragrances, colors or parabens. Ideal for those with pigmentation imbalance. Avobenzone (3.0%), Octinoxate (7.5%), Water/Aqua/Eau, Carthamus Tinctorius (Safflower) Oleosomes, Butylene Glycol, Glycerin, C12-15 Alkyl Benzoate, Polysorbate 80, Dimethyl Capramide, Cananga Odorata Flower Oil, Eucalyptus Globulus Leaf Oil, Lavandula Hybrida Oil, Lavendula Spica (Lavender) Flower Oil, Laminaria Ochroleuca Extract, Palmaria Palmata Extract, Oligopeptide-34, Dipotassium Glycyrrhizate, Lactobacillus/Pumpkin Fruit Ferment Filtrate, Niacinamide, Zinc Glycinate, Sodium Hyaluronate Crosspolymer, Polysorbate 60, Ammonium Acryloyldimethyltaurate/VP Copolymer, Vinyl Dimethicone/ Methicone Silsesquioxane Crosspolymer, Hydroxyethyl Acrylate/Sodium Acryloyldimethyl Taurate Copolymer, Isohexadecane, ButyleneGlycol Behenate, Glyceryl Polyacrylate, Disodium EDTA, Sodium Hydroxide, Ethylhexylglycerin, Phenoxyethanol.